Try this easy baby quilt pattern the next time you need a quilt for a little one. It's larger than a crib size quilt, so perfect for toddlers, too. If you don't need a baby or toddler quilt, use the pattern to make a lap quilt, or to create a wallhanging. Tailor the design to suit your needs by choosing quilting fabrics with a different theme. The strippy set baby quilt is assembled with four wide columns made by sewing rectangles of quilting fabric end to end. Wide columns are surrounded by five narrower columns made from easy strip-pieced segments. Finished Quilt Size: 59" x 63"
To make a quilt similar to the illustration, choose an assortment of black fabrics for the wide columns and the outer border. Select a scrappy assortment of red fabrics for the narrow columns and a white with black print for the narrow inner border. Use the same fabric more than once or go very scrappy with 14 different prints. Cut a total of (20) 3-1/2" x 19" strips from at least six different red prints -- add more variety if you like. You'll need more yardage to cut lengthwise grain borders. Read through the instructions to find out just how easy it is to complete this strippy set baby quilt pattern. Make a strip set for the quilt by sewing four 3-1/2" x 19" different red strips together lengthwise. Press to set the seams and then press seam allowances one direction. Square up one end of the strip set and cut (4) 4-1/2" wide segments from it. Make four more strip sets from the remaining red strips, varying the fabrics and/or fabric placement in each set. Cut a total of 20 segments from your strip sets. Create the columns by sewing four segments together along their short ends. If you prefer, leave the segments unsewn for now and place them on a table or design wall. When it's time to design the final layout, move the segments around until you're happy with the layout. This little strippy set quilt has four columns made from 6" wide black panels. Sew each column together as explained below, or arrange pieces adjacent to the red columns if you prefer to preview the position of the prints before assembly. Sew three 16-1/2" long black/white panels end to end to create a column. Set the seams and press seam allowances either way. Repeat to make another column from the remaining 16-1/2" long panels, altering the position of any repeated fabrics. Combine four 12-1/2" long black/white panels, sewing them end to end to create a column. Repeat to make another column from the remaining 12-1/2" long panels. Press seam allowances in either direction. 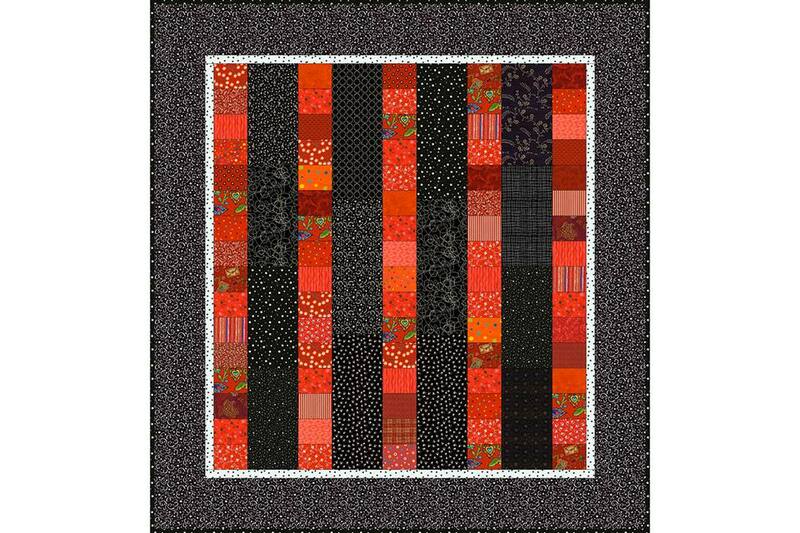 Arrange all columns for the quilt into vertical rows, beginning and ending with a red column. Sew pieces in each column together when you're happy with the layout. In the illustration, black columns with four panels are sewn to red columns at the quilt's outer edges. Sew the rows side by side, matching end points and mid points carefully. Use 1-1/2" wide strips of the white/black print to add a narrow straight-set border to the quilt. Use the straight border instructions to construct the borders and sew them to the quilt. Use 6-1/2" wide strips of the black/white print to add the wide outer border. Mark for quilting if necessary. Sandwich the quilt with batting and backing and baste. Quilt by hand or machine. Trim and square-up excess batting and backing and sew binding strips around the quilt's edges.